Our 1 Ball 5 Tee Clam features custom printing capability to create impressive Company Logo Products. This 1 Ball 5 -Tee clam holder is an ideal giveaway for any golf lover. The neatly packed plastic clam holds one Callaway Warbird 2.0 golf ball and five 2-3/4" blank white wood tees. 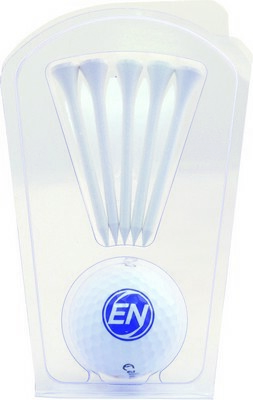 It is a convenient and compact design with the golf ball and tees together. It presents a clean, professional and sporty image of your brand. You can imprint your logo on the equator of the golf ball and showcase it through the clear plastic clam. Promote your branding and message across in a novel and exciting way!